Nothing is quite as attractive as great-looking skin! Begin with your Skin Medspa Center uses the latest, most advanced techniques in microdermabrasion. This procedure helps diminish imperfections of the skin such as fine lines, sun damage and acne scarring. Microdermabrasion is the latest scientific method using fine inert (micro) crystals to progressively abrade the skin's surface. Microdermabrasion is used for skin resurfacing and treating a range of skin abnormalities. This treatment has been used in Europe for years and now this exciting microdermabrasion procedure is helping men and women in the United States experience remarkable improvements in their skin texture, regardless of skin color. With our Microdermabrasion skin treatment program, you can see immediate improvements in your skin's appearance. 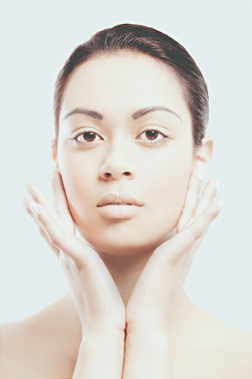 Microdermabrasion offers a unique approach, which removes dead / flaking skin cells and stimulates the production of fresh young skin cells and collagen. Microdermabrasion is an exciting procedure that can be used to treat fine lines, acne, hyper pigmentation, sun damage, and scars in under an hour, with no recovery time! I love my legs, I love my face, best of all, I love all of you. Every other week, I go for my lunchtime peel. I am thrilled with how much softer, smoother and more refreshed my skin looks! Immediate visible results due to the vacuum action on the skin causing a edema type of swelling of the dermis which diminishes the appearance of fine lines and wrinkles (stretches the skin and makes it tighter). The vacuum action also increases blood flow into the dermis which increases fibroblast activity which in turn causes an increase in collagen and elastin formation over a short period of time. Abrasion of the stratem corneum removes keratin cells and the mortar layer between the cells which will allow for more topical serum penetration of nutrients into the dermis. This in turn will help in the formation of a new stratum corneum layer to the skin. Microdermabrasion does not exhibit any of the acid burn characteristics associated with acid peels and there is no appreciable downtime. Our treatments are painless yet effective. The degree of effectiveness is controlled by an adjustable vacuum. Results will be noticeable from the first treatment, however a full treatment protocol is 5-8 treatments with one treatment every 10-14 days and maintenance visits every 2-3 months. Your skin may look slightly flushed immediately after the treatment but should return to normal in 10-30 minutes. Your skin will look and feel smoother and more youthful even after your first treatment and will continue to improve with additional treatments.